You'll love the style and storage that you get from the Big 6 Drawer Dresser when it arrives, but after a few years you'll come to love how it's become a stalwart centerpiece of your child's room. You get this useful longevity from a solid hardwood body with quality, dovetailed drawers that are center reinforced and roll on smooth, ball-bearing guides. Metal-reinforced feet and moulding-detailed edges just add to the quality. Choose from the available finish choices, and you're ready to go. Dimensions: 62.25W x 19D x 34.5H inches. 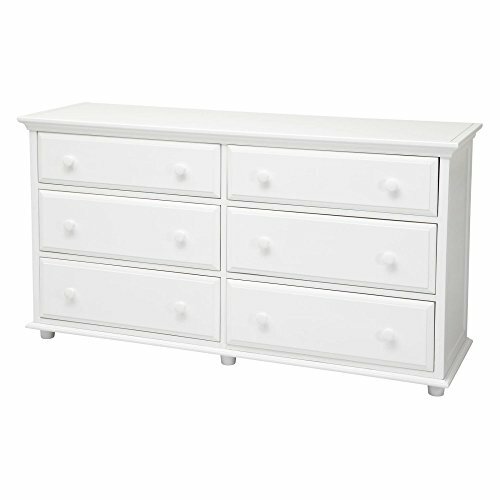 Wide, roomy dresser for storage and style. 6 dovetailed drawers in a solid hardwood body. Reinforced drawers roll on ball-bearing guides. Safety stops and anti-tip kit for your child's safety. Available in your choice of finishes. If you have any questions about this product by Maxtrix, contact us by completing and submitting the form below. If you are looking for a specif part number, please include it with your message.